You must be a member of the Frankfurt Talk Spanish Group to attend this activity. Would you like to join this group? 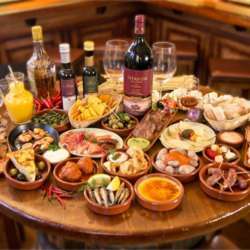 One more time we will meet to enjoy a typical Spanish dinner in a typical Spanish restaurant. We taste the traditional "tapas" and Spanish drinks. And most important, this is a new opportunity to meet, speak Spanish and laugh together. This time the MI will be in the Protected content ". A restaurant located in the city center near the Konstablerwache, where waiters, all very friendly, will speak to us in Spanish. You can add your name to the event’s guest list by clicking the Accept Invitation button. Please signup if you are sure you can attend, if for any reason you could not attend the event would appreciate it erased from the list of guests. Feel free to bring your international friends and co-workers, but please invite them to register on InterNations first. We hope you can join us and that we all have a nice dinner, eating and drinking Spanish product, chatting and meeting new friends. The number of participants is limited to 45 people.